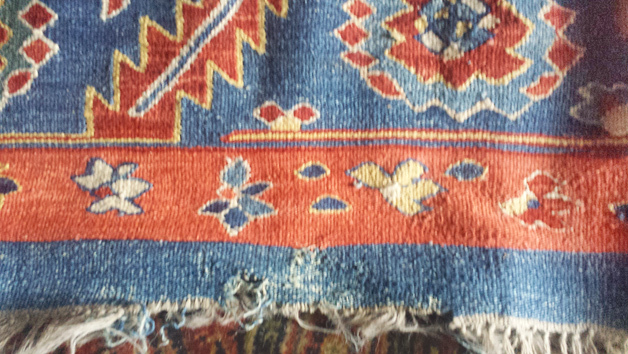 Photo showing moth damage and missing pieces of of a section of this beautiful flat woven semi-antique kilim rug. Photo showing detail of expertly repaired area which has included the reweaving of missing areas of both the rug and fringe. Expert repair! The restoration process has included exact matching of both the rug's color and design pattern as well as the weave pattern and knot density. doesn’t have a pile, the color and weave is extremely apparent and any repair that has even the slightest difference in dyes or weave technique will be very obvious to the eye. 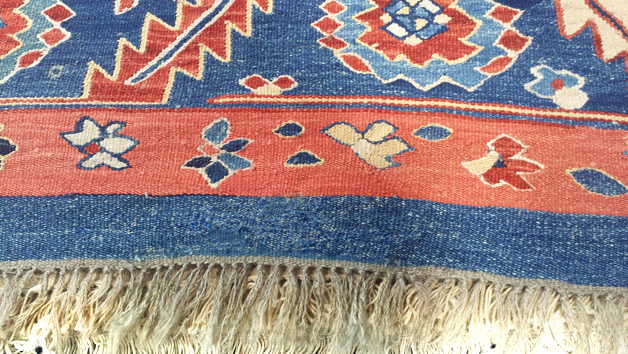 It takes a great deal of experience and skill to repair kilims to a high level of restoration. A client from Doylestown Bucks County PA had a beautiful semi-antique kilim rug in storage and found significant areas completely missing due to moth damage. The clients brought their treasured kilim to Nejad Rugs for the repair work. Our knowledgeable artisans were able to dye the exact wool colors perfectly matching the rug and expertly reweave the missing pieces making it virtually impossible to find the original damaged areas. 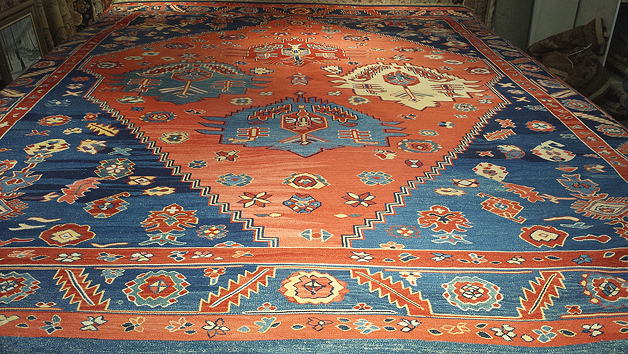 Nejad Rugs has been the Tri-State area’s most trusted Oriental Rug Wash and Repair Company for over thirty years. Please call 215-348-1255 for all your Oriental Rug service needs.